(Please Note that some of the features detailed below are only avialble in the SimplyPats (Full Downloading Edition) software. The differences in versions mainly relate to Import/Export of Data and support for Downloading PAT Testers and/or Import/Export of data from supported Apps developed by SimplyPats. SimplyPats (Full Downloading Edition) - Supports Download of Data from over 50 PAT Testers, has the ability to import and export data from compatible Android and iOS Apps developed by SimplyPats (inc Data recorded when using the Kewtech SMARTPAT in Remote Mode), and the Manual Entry of PAT Test Data. This version also supports import and export of CSV data as well as other formats. This version is the only one that also supports the import and export of data in various formats such as CSV. SimplyPats Manual+ (Manual Plus Edition) - Has the ability to import and export data from compatible Android and iOS Apps developed by SimplyPats (inc Data recorded when using the Kewtech SMARTPAT in Remote Mode), and the Manual Entry of PAT Test Data. With full Reporting and Invoicing. SimplyPats Manual Edition - Manual Entry of PAT Test Data only with full Reporting and Invoicing. The latest Downloading Edition of SimplyPats can download or import data from over 50 different PAT Testers from various manufacturers. Manual Entry of Test data is supported in all versions of SimplyPats. Development on SimplyPats started in 1999 with Version 1 being released in 2000. It has grown from supporting just two downloading PAT Testers, the Seaward Supernova and Europa to over 50 different models while still maintaining the backward compatibility of data from earlier releases of SimplyPats. Support for SimplyPats Version 7 is currently offered as a free service and generally avialable from Monday to Friday 10am to 4pm unless advertised differently. While we regularly support our product out of hours (weekends, public holidays) via email, forum, Facebook and twitter pages, this is not official so please expect delays. Our large Australian and New Zealand user base have access to the same level of support from us direct. We believe our customer support is one of our key strengths. If you have downloaded the Demo we recommend that you open the Example PAT Data File that we have included as this will allow you to have a look at the features and functionality in more detail. Once you have a PAT Data file loaded, have manually entered data or have imported data from your PAT Tester the main screen in SimplyPats will look similar to the screen shot below. The main screen can display a lot of information, which is why we have added a number of accessibility options giving you control over what gets displayed; the main columns and data areas on the right can be turned on or off and the text size and row height can be changed. We have also included a small and large icon set; larger icons will be displayed for higher resolution screen sizes. SimplyPats innovated many of the features now found in competitor’s software such as; Exporting data as a spreadsheet, creating PDF’s, use of abbreviations to save time entering asset information, invoicing, retest scheduling, spell checking and Photos. We believe we first introduced commercial Manual Entry software for non downloading testers and were one of the first to develop mobile PAT testing software in 2003. Thousands of users have continued to use our software since it was introduced into the market in the year 2000. SimplyPats supports the import or download of data from over 50 downloading PAT Testers across various manufacturers, offering the greatest compatibility of any PAT Testing software currently available. This may be of particular interest to those people who use a number of different PAT Testers, or those that do not want to use the Manufacturers own PAT Testing Software, or maybe you Hire a PAT Tester on a regular basis. Where possible RAW Data Imported or Downloaded from the PAT Tester is in the Manufacturers native format, which may depending on the tester contain additional data not included in legacy formats such as ASCII for example. Data downloaded from multiple PAT Testers can be merged into one single file regardless of manufacturer or model. Upload of data back to PAT Testers that support this option is available for many machines. More than 40 printed reports available as standard including Appliance Register, PASS/Fail, Single Appliance per page and Certificate of Portable Appliance Testing. Reports can be customised by the user to include logo and electronic signature. A large number of Reports with shaded sections can be colourised which gives you the possibility to match the Report colour to your Company Logo colour, this can give your PAT Reports a whole new look. Customised reports created on request. A charge may apply, quotes available on request. Suite of reports conforming with the IET COP 4th edition. Export DATA as Access Database (mdb) or Excel Spread Sheet (csv). In addition to the above export, SimplyPats also includes a highly customisable dedicated Import and Export CSV option (XML and JSON also supported). Drag and drop appliance information from SimplyPats to Word, Excel or any OLE enabled program. Ability to overprint PAT testing labels either from A4 or roll stock providing the PAT Labels match one of the supplied templates. Export Retest information to Microsoft Outlook or use the on screen calendar for a quick visual overview of retests due. Functions to email client (with or without data attached) create a word document automatically or advise of retests due. Quickly view and print a report of appliances which are over due for retest and also appliances which are due for retest in the coming days, weeks or months. Or enter a date range to create a Report of all appliances due for retest within those dates (for the current data file). Comprehensive view, sort and group appliances on the main screen as well as advanced options to Bulk change data either globally or on a selection of appliances. E.g. change a selection of Appliances to 6 Monthly Retest Periods. Validation features are used to highlight appliances which have missing data such as: Missing Descriptions, Electrical Retest Periods and Visual Retest Periods, Overdue Electrical and Visual Tests and Appliances without Charge information. Sophisticated invoicing system to assist contractors. Charge and repair codes can be entered in the PAT tester on site (where that tester has a spare notes field), SimplyPats can then use this information to automatically create an invoice. Enhanced invoicing features including price schemes for different customers, volume pricing, extra charges, discounts, VAT and GST (Australian / NewZealand) tax. Manage your PAT data the way you want, create one Master File or store your PAT data by month/year. Merge data files, save selected Sites or Locations to a new data file. 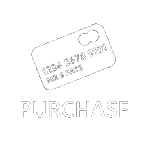 Store your PAT Data in a central location, allowing multiple users to access the data (additional SimplyPats licences may be required). 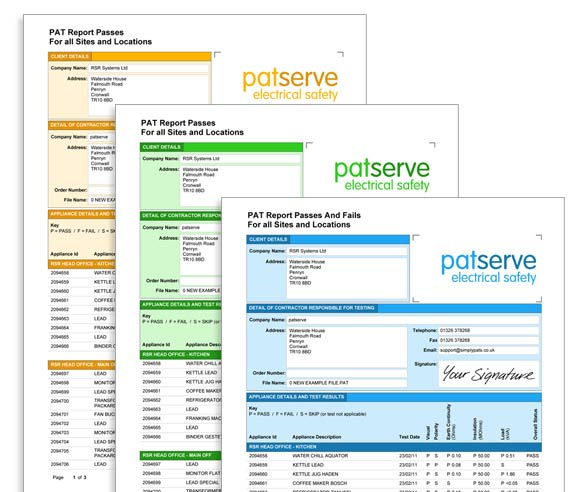 Setup a print and PDF export list for your most commonly used PAT Reports, these can then be printed, exported and emailed with the click of a button. Import and Update master file with the option of producing a report of Tested Items, New Items and Missing Items. Option of using Abbreviations for Appliance Description, Site and Location to save time, these can then replaced with the full word after download. 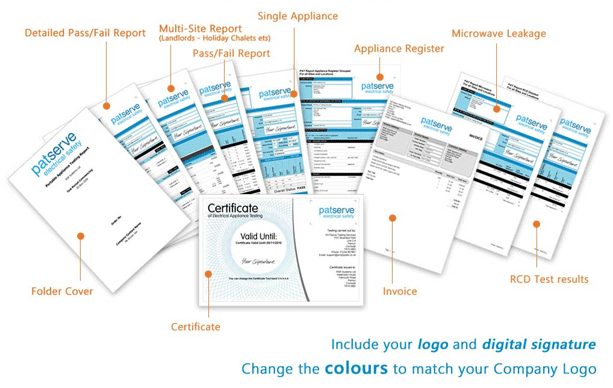 Record Microwave Leakage and RCD Test Results (Dedicated Reports can be printed / exported). See information quickly, actual PAT Test results together with limits and overall status for any given appliance can be viewed on the main screen by clicking on the appliance in question. View a graph detailing test results, showing the possible degradation over time (I available if you are using unique appliance id’s). Import and Export PAT data to inspHire Specialist Hire Software. Manual Entry of PAT Data supported with many features to speed up the entry. E.g. predictive text, quick set limits for Class I, Class II etc. Access to free software updates for the current version, with future Version Upgrades available at a reduced price. Many usability features to select what information is displayed or hidden on the main screen. Adjust font sizes etc to assist readability. Flexible and cost effective Licencing options available where a Multi User or Multi Site solution is required. We will go through some of the features in more detail below, however as SimplyPats is constantly in development we would suggest that you also look at the latest information available on our forum or social network pages. SimplyPats ships with a large selection of PAT Reports, some of which can be Colourised to match your Company Colours. A Digital Signature can also be added, or if you prefer you can leave the space blank or sign by hand. All Test Reports can be exported in the following formats; PDF (Adobe Reader), MS Word, MS Excel, HTML, Text or Tiff. The Print Sequence feature allows for multiple Reports to be printed, exported and emailed using a single button press. This also includes options to export separate PDF or merge all Reports into the same PDF document, all this while printing each individual Report to a specified printer. 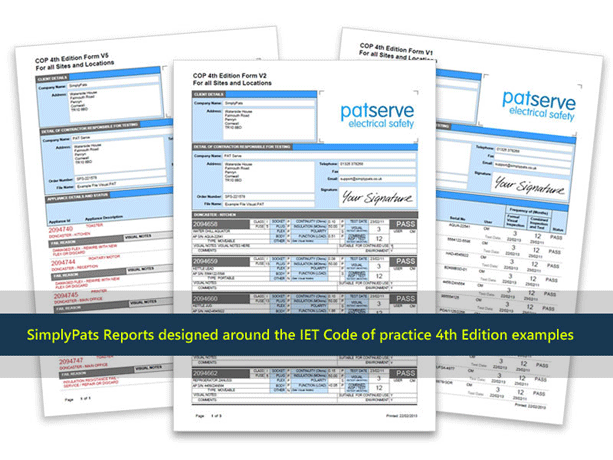 the following are three examples of PAT Reports designed with the IET Code of Practice 4th Edition in mind. As shown in the examples below, almost all of the Reports added over the last few years inherit the “Colour Scheme” option where you have the ability to set your own colours for certain areas of the Report. Black and white as well as greyscale options can also be selected if needed. Dedicated CSV Import and Export features with user customisable options bring alot of flexibility if Data Import / Export is required. This may be especially useful if you have existing data from another program or source or if you are using a spreadsheet application to record test data. The export of data in XML and JSON is also available via the dedicated CSV Export screen. From here you can choose what fields to export and in what order to export them, you can also rename the column headers. * This feature is NOT available in SimplyPats Manual Edition or Re-branded Versions. The detailed Manual Entry screen gives you the option of entering asset information and test results straight from the PC. Features such as predictive text and Quick Select Test Limits make data entry more accurate and less time consuming. Additional features to speed up allocating a Test Status are also available to use, one touch buttons for CLASS I, CLASS 2 or LEAD allow you to quickly set the status to PASS for relevant tests. Formal Visual Test Data can also be entered via the Formal Visual tab on the Manual Entry Screen. If your PAT Tester has a method of entering text, you can choose to use the full word or abbreviations to enter certain data, these can then be automatically replaced with the long description in SimplyPats. Abbreviations of up to four characters can be used while adding a space will allow you to enter multiple descriptions such as Make followed by Appliance Description for instance. Manage your PAT Data how you want; maintain one data file or maintain separate Data Files, split, merge, import and update data or save selected data to another Data File. Store your Data Files on a Server or location of your choice, in one folder or in separate folders by Customer, Date or Year for example. Maintain one Master File for your in-house testing or customer that contains only the latest Data by using the Import and Update feature to overwrite the test data with current data. Alternatively, maintain historic Test Data by archiving the old data. Multiple Sites in the same Data File can be quickly be exported to individual Data Files, ideal if you have downloaded data for multiple customers or sites from the PAT. Data files can be exported from the Main Screen in CSV (Excel) and MDB (Access) Formats. Certain Data can also be exported by dragging and dropping into other software that supports OLE such as Word or Excel. Data can easily be sorted by clicking on any of the column headers while the Grouping feature allows you to arrange data into expandable and collapsible groups (See image). Both of these features present users with flexible viewing options but also make editing features such as Bulk Replace Selected much easier to use. If you are looking for a particular appliance, you have two main options. 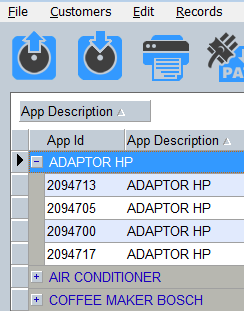 If the Appliance is in the PAT Data file that you currently have open you can use the Quick Find Feature. If you want a far more advanced option or you want to search for Appliances throughout all of your PAT Data files then you can use the Find Appliance Globally feature. The Find Appliances Globally feature will allow you to search for an exact Appliance or a group of similar Appliances depending on the search criteria entered. On top of this, you also have the option to enter a date range. Most of the data on the main screen can be edited by simply clicking in the relevant field, however if you want to make changes to data on a large scale the Bulk Replace feature is there to make the job easier. Bulk Replace will change X to Y within the current data file, while Bulk Replace Selected will only change X to Y for those records currently selected. In certain circumstances both of these options can save huge amounts of time. Common Reports such as the Appliance Register, Pass/Fail Report and Certificate of Testing provide enough detail for most users requirements, however you also have the option to produce more detailed Testing Reports together with a Folder Cover if needed. User definable colour schemes help to give your Test reports a unique look. These can quickly be matched to your company colours and look very professional when matched to your company logo if used. As well as displaying your logo, you can also include your Digital Signature on some of the Test Reports or leave the space blank to sign by hand. Adding commonly used Reports to the Print Sequence feature will give you access to one button printing and even the option to export each Report as a separate PDF or merge all Reports into the same PDF document, all this while printing each individual Report to a specified printer. 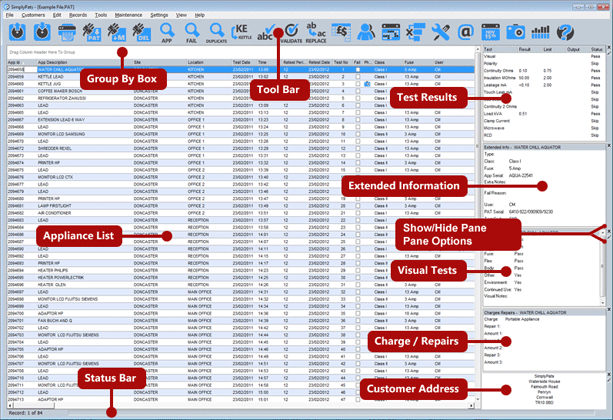 Automatically generate invoices based on charge and repair codes entered into the PAT Tester at time of test (codes can also be added within the software). Invoices can be created as soon as the test data has been downloaded or imported into the software and show detailed information relating to the job. Other options such as; Auto incrementing Invoice Numbers, Discount options, Multiple Price/Repair Schemes, Extra Charges, Invoicee Address, VAT/GST Rate, Save Invoice, Print Invoice, Enter Fixed Price and print a Receipt instead of Invoice if payment has been received. As with the Reports, the Invoice or Receipt can be exported in the following formats; PDF (Adobe Reader), MS Word, MS Excel, HTML, Text or Tiff. The Review Customers screen or Retest Calendar both offer a visual overview of Retest Dates and clicking on a date on the calendar allows you to open the data file for Appliances due on that date. If you are using Microsoft Outlook (Outlook 2010 64 bit not currently supported) you can also send the Retest Dates along with other information to Outlook as an appointment. A Retest report is also available and can be based on any of the standard Test Reports, simply enter a from/to Date Range to show all Appliances within the current data file that are due for Retest within that period. If you want to produce a Report showing all Overdue Appliances in the current data file. Entering a figure relating to a number of days will show all current overdue Appliance as well as all those Appliances due to be classed as overdue within the range entered.